Most parents will agree that raising kids is capital-d Demanding! I think a lot of what makes the job so hard is that we’re constantly adapting and learning on the fly. For instance, when your kids need help deciphering an inscrutable math assignment, who’s the one watching Khan Academy videos to get up to speed? And what about that science project, due tomorrow? I’ll bet you and your kiddo are gonna need some serious YouTube time to figure out how to make a bunsen burner out of a candle and aluminum foil. But for all the stress and the late nights, the job of parenting is loaded with upsides. One of my biggest rewards has been an enhanced appreciation for what it takes for people (big and little) to learn and grow. In fact, I’d say I’ve learned more about myself, how I learn, and how I design instruction from raising kids than I’ve ever learned on the job! Here are just a few of the learning (and life) lessons my kids have taught me. I think it was a Sunday around 9 pm when my eight-year-old son casually mentioned that he had to write and perform an original song about Abraham Lincoln the next morning. Oh, and his song needed to use all sixteen of his vocabulary words. Hello-o-o-o panic! This story has a happy ending, courtesy of my network of friends and colleagues on social media. In the face of a high-pressure creative crunch, I threw out a quick plea for help on Twitter and Facebook and before I knew it, my generous friends, along with my son and me, had crafted a snappy little tune that earned him an A+ from his teacher. It also gave one of our late night collaborators the chance to add a new song to her repertoire. When you’re in a crunch, your first instinct may be to lock yourself in a room and try to crank something out. But that doesn’t always end up with A+ results. That kind of isolation can lead to training tunnel vision—a course or other solution that only speaks to one part of the problem, or tries to hit on every single problem at once. A network of peers actually serves as a catalyst for creative problem-solving. With one person working on the melody and another keeping track of the words you’ve already used, you’re able to focus on writing lyrics that rhyme with “Lincoln” and “compassion.” By spreading the load across a handful of people, you can simultaneously narrow your focus and broaden your productivity. Being an instructional designer, much like being a parent, is about making peace with the fact that your role is often reactionary. Try as we might, we simply cannot prepare ourselves or our learners for everything. And in the absence of being perfectly prepared, having that network or “village” of support can make the difference between merely coping with adversity and really growing from it. I don’t know about the rest of you, but I find the task of constantly explaining myself to be utterly exhausting. (This gets exponentially harder with siblings, by the way.) For instance, I was navigating a busy parking lot the other day and my daughter was full of questions about why I chose to perform certain driving maneuvers, like giving way at a four-way stop or using my turn signal to claim a soon-to-be-open parking space. As I struggled to explain the complicated rules of parking lot safety and driving etiquette to a ten-year-old, I quickly realized I was too wordy. And I was using terms and concepts that were way out of her depth. Once I recognized the problem, I was able to make my answers simpler and more direct. I broke down my actions into small chunks and then used analogies to help paint a picture she could relate to. In this way, my explanation of waiting for a parking space jived with her experience of waiting for her turn on the swings at recess. Breaking down content into smaller chunks and reframing it with simple, relatable analogies makes your ideas come alive for learners. Simplifying concepts and making them accessible to others isn’t about “dumbing down” your content; it’s about giving folks the footing they need to make the meaningful connections that boost learning. Halloween is a family favorite in our neck o’ the woods. Our kids start planning their costumes months in advance. And as my children’s grasp of the world has grown, so have their expectations for their costumes. 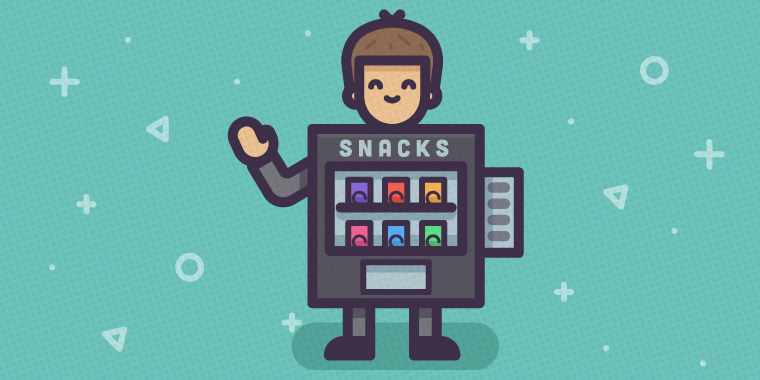 For instance, last year my son asked to be a vending machine—preferably one that looked as real as possible. 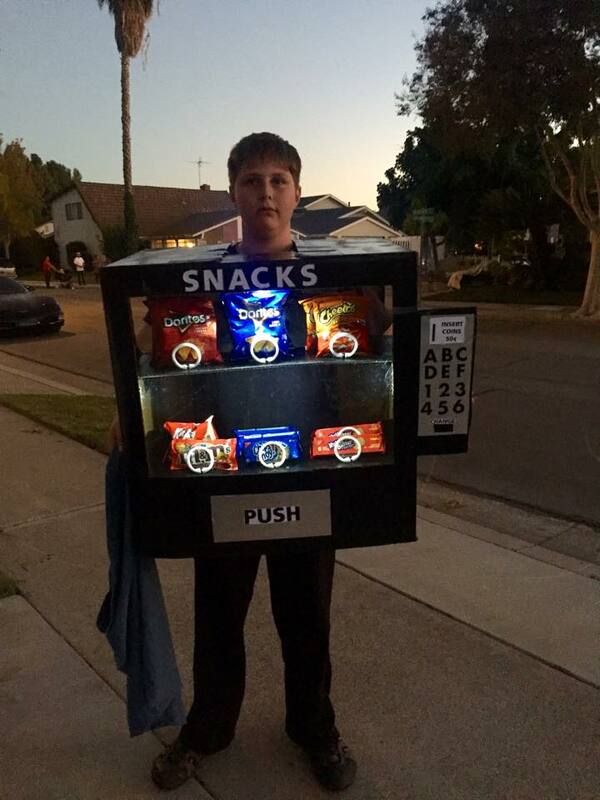 We scoured the web for vending machine costumes to buy, but soon realized that they were both rare and pricey. They also lacked the authenticity (i.e., the real snacks) my son was going for. That meant we needed to go full-on MacGyver on this costume. First, the three of us—me, my husband, and my son—collected requirements. How big did it need to be? How would it work? What could we afford to buy with our limited costume budget? Then, we sat down and sketched out ideas. Once we had the basics mapped out, we went out to the garage and started letting our imaginations run wild. A cardboard box became our vending machine, some old shower curtain rings, cable ties, and a few stick-on LED lights made our machine’s interior come to life, and then lots and lots of duct tape provided support and stability. By the time we were done, my son had a show stopping costume AND a great hands-on learning experience. And we were all reminded that using what you have doesn't mean you'll end with lousy results. Did it take longer to build a costume than to buy it off the shelf? Sure. Did it look homemade? Yep. But by making do instead of buying new, we turned what could’ve been a dull assembly project into a full-blown exercise in design thinking and collaboration. When you’re considering your training options, bear in mind that what you already have may be good enough. You don’t necessarily need to buy something sleek and full of bells and whistles if a simpler, home-grown solution will do the trick. In the end, it’s not what you have, but what you make with it that matters. And who knows? Maybe you’ll end up with a showstopper of a course AND a whole new set of skills for your resume. There are plenty more learning and life lessons for you, courtesy of your fellow e-learning pros on E-Learning Heroes. Check out some of these related articles for some more food for thought. E-Learning: Should You Buy It or Build It? What’s been your biggest source of instructional design learning? Who’s inspired you to learn on the fly? Leave me a comment and share your stories … especially the ones where your kids taught you a lesson or two! Enjoyed this article? Follow us on Twitter and come back to E-Learning Heroes regularly for more helpful advice on everything related to e-learning. I love this Trina, I can relate so much! I am also very impressed you used a McGyver reference, nice! Thanks, Veronica! I wear my 80's kid background with pride. Glad you share in my love of McGyver pop culture references...and e-learning! "In the end, it's not what you have, but what you make with it that matter" I am in love with this piece Trina..Not only, it's informative but it gives one so much hope and upbeat. P.S Your kid makes an adorable vending machine. Check out Shovels & Ropes's song "Birmingham". Their motto "It ain't what you got, it's what you make." GO JANE! GO TRINA! GO ABE! Thanks for the article, Trina. Some great learning and life lessons there! Love the Abraham Lincoln Song! Heading out after work to find a kazoo! As an educator I think your Halloween Costume Experience says it all. Doing and creating is so much better than rushing out to buy. Learning through exploration and even failure is much richer. The costume was fantastic!! Good job Mom. You know, Heather. I actually proposed using some chewing gum to lend stability and flexibility to our shelf supports since they moved up and down slightly when my son walked. But we ended up going with the more sanitary (and less gooey) duct tape solution. So much for my legit MacGyver hack... Thanks for reading the article and taking the time to comment! If memory serves, every moment with a 2 1/2 year old is a pretty challenging learning experience. I'm sure you've become (rapidly!) fluent in toddler speak by now. Being well on the other side of that, I can say that it gets easier and MacGuyer was right..."a whole 'nother set of fresh possibilities" is around every corner. Thanks for reading and chiming in! FYI: On Monday I ended a conference keynote presentation with the Lincoln song. With kazoo. I love this so much, Jane. Can't thank you enough for helping me get out of a creative jam AND giving me great article fodder. Also...the kazoo. It's perfection. SO depressed I missed the live performance! I got to see this song live at the Adobe Conference in DC! It was Awesome, Jane. Go Abe! I attended this conference. I must say the song is great in person!